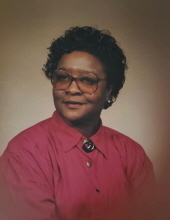 Mrs. Janice Faye Andrews Goins, 71, transitioned from labor to reward on March 31, 2019 at Christiana Hospital. Funeral services will be 12 PM Saturday April 13, 2019, at Mills Funeral Home Chapel. Interment will follow in Mills Memorial Garden. Viewing 11 AM- 12 PM Saturday at Mills Funeral Home, Inc. She is survived by her son Jermaine Goins of New Castle, DE; sister Joan Tilghman of Kinston, brother Stacy Andrews of Kinston; nieces, nephews, other relatives and friends. To send flowers or a remembrance gift to the family of Janice Andrews Goins, please visit our Tribute Store. "Email Address" would like to share the life celebration of Janice Andrews Goins. Click on the "link" to go to share a favorite memory or leave a condolence message for the family.